What's up. I decided to take a break from not posting for awhile. I just started the webpage for my comic, "Crack Kills". I started Crack Kills when I was in highschool. When me and my freind, Jon got bored in school(the same Jon who I'm still freinds with today), we would draw comics that mostly featured people getting hit with big mallets. Eventually I started incorporating regular characters into my comics. When I was in techschool for the airforce, I drew the oyster comic, which was one of the origionals, on my paper nametag that we made to set in front of us when we were in class. My freind Jay wrote "crack kills" next to the comic. 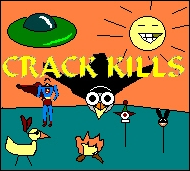 Many years later, after I had gotten out of the military, inspired partly by Jons web comic, Hank the Squirrel and a video called the Lonliest Cloud, I decided to redo all the comics that I had done on the computer and call them Crack Kills. Jon posted them on his website for awhile. Recently, I decided to make a Crack Kills website, so I'm posting five out of 40 of them per week.